Check for live lice or viable nits. Head lice and nits are primarily found on the scalp, behind the ears and near the neckline at the back of the head. In a well lit room, part the hair, checking for nits or louse. Continue parting the hair in small sections paying particular attention to the areas noted above. If you have a good metal lice comb, use it to comb over the scalp, wiping on a paper towel to check for lice or nits. See below for pictures of head lice and nits. Nits: Nits (head lice eggs) are often confused with dandruff or other hair debris, however, nits are connected to the base of the hair shaft and will not easily move. If it flakes off, it is not a nit. They are 0.8 mm by 0.3 mm (about the size of a knot in thread), oval and usually yellow to white, though they can sometimes appear the same color as the infected hair. Nits take about 1 week to hatch (range 6 to 9 days). Viable eggs are usually located within 6mm of the scalp. Nymphs: The egg hatches to release a nymph . The nit shell then becomes a more visible dull yellow and remains attached to the hair shaft. The nymph looks like an adult head louse, but is about the size of a pinhead. To live, a nymph must feed on blood. They become adults about 7 days after hatching. 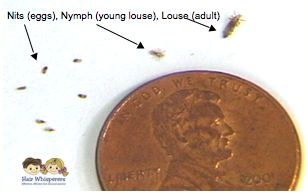 Adults: The adult louse is about the size of a sesame seed, has 6 legs (each with claws), and is tan to grayish-white. In persons with dark hair, the adult louse will appear darker. Females are usually larger than males and can lay up to 8 nits per day. Adult lice can live up to 30 days on a person's head. To live, adult lice need to feed on blood several times daily. Without blood meals, the louse will die within 1 to 2 days off the host. If you find nits or lice, treatment should be provided immediately. Often after a lice diagnosis, clients will comb with our lice comb and discover small particles of dirt, dandruff, or other substances in their hair, and mistake it for lice. Please include your name and phone number, so she can contact you to confirm if what you found is head lice, nit, or neither. Please note that this is a service for our current clients only. If you have not been treated twice by The Hair Whisperers in the last 30 days, no response will be provided.